It's cold outside. Snow flies through the frigid air, seemingly moving in four directions at once. A man trudges along the sidewalk, his frozen footsteps creating the only noise beside the incessant flurries of frost. At least, it was before this past winter. I know this town too well not to appreciate the mild months we've been granted. Erieites understand this. The weather is just another part of the varied charms and curses this area provides on a daily basis. Even I, a native Clevelander who moved here five years ago, consider myself, at least in part, one of the local denizens. So, seeing a man make his journey through entrenchments of snow doesn't feel like a scene unfolding on the screen in front of me: It feels like Erie, a multifaceted character we all know quite well. The people behind Lyons Den Productions, an independent film production company out of Edinboro, understand this. That's why they filmed the majority of "There Are No Goodbyes," their second full length film after 2008's "Schism," here in the Gem City. A tale about a directionless man given a series of tasks that begin to give his life meaning, "There Are No Goodbyes" can be seen at an advance screening in the Louis C. Cole Memorial Auditorium at Edinboro University at 8 p.m. Thursday, April 19, and an encore showing Saturday, April 20, at the same time. While the film is still being worked on, an advance screening with an audience is a far cry from where "There Are No Goodbyes" was four years ago, when John C. Lyons and Andy Flatley started working on it. "I came up with the story in the summer of 2009," said Flatley, co-producer for "There Are No Goodbyes." "I was hitting John with a bunch of different ideas, like a lot of people do because John is a filmmaker. Finally, something stuck and we started working on it that summer." Lyons, who directed the film and produced it with Dorota Swies, went through five scripts with Flatley, who also has co-producer credit, before the story began to take shape. "It's funny to look at the early notes we took and see how [the story] morphed into what it became, because it was a love story and went in two different ways," Lyons said. The film still has romantic elements, but it grew into much more than that. "There Are No Goodbyes" revolves around the life of Oliver, a 30-year old native of Erie. He has no job, no family, and no motivation to really do anything besides hang out with his elderly friends. Eventually, a strange series of boxes appear at his door, giving the miserable man a series of tasks. While questioning the reasons behind his newfound purpose, Oliver starts opening up as he meets Raina, an outgoing photographer. It doesn't take long before Oliver has to take action, breaking out of the monotony he's become used to. Eventually, the script had progressed to the point that the filmmakers needed subjects to film. In late 2010, Lyons, Swies, and Flatley held open auditions, where around 200 hopeful actors tried to make enough of an impact to be cast. "It was tough for the actors," Lyons said. "It's the [Erie] Playhouse rehearsal hall, so it's this huge room with mirrors behind us, and we're sitting there on the far side with a camera, and they have to walk in all the way across." It was at these auditions that they found their major performers in Matthew King, Jennifer Hooper, and Frederick Williams. King was tabbed to play Oliver, the quiet, depressed main character. "I went to film school, so I was in everybody's films and they were in my films," King said. "It was something I always liked to do, but I never really tried to audition for something big." It wasn't until his brother told him of Lyons Den Productions' newest feature that the film school-short veteran was cast in a full-length film. Due to the disparity between men and women at the audition, King ended up reading for several hours with the surplus of women trying out for Raina, Oliver's love interest. Of the plethora of hopeful actresses, Hooper emerged victorious, claiming Raina as her own. While King and Hooper ended up with the characters they tried out for, Williams' route to "There Are No Goodbyes" ended up much differently than he had envisioned. In fact, he almost didn't audition. "I left [Lyons] a message on his phone about 'Is it really worth me coming down?' because I wasn't going to go," Williams said. "I swear to God, if he didn't call me back, I would've never gone down." With Lyons' push, Williams went down to try out for the role of Jimmy, Oliver's helpful older neighbor, a role he thought he fit in both age and demeanor. Instead, he ended up playing Fenris, the mystifying man that shakes up Oliver's world. With Williams' arrival, Flatley started envisioning the role of Fenris to fit him. "Our original idea was that of the true spy, the little grey man, the guy you would never notice that is in the room," Flatley said. "A little different than what we ended up with. We had people come in, and the character of Fenris is mysterious, so everyone came in and played it up as this kind of Vincent Pryce-y kind of thing and it just didn't work." "I think with Fred not preparing for the role, we got to see something without being kind of affected like some others coming in audition for that part." Instead, Williams' deep, commanding voice and large stature changed the film, an impressive feat for someone who had never done any acting before. With only his experience as a lector in church to aid him, Williams made the transformation from his talkative self to the mysterious Fenris. "I had never been at any kind of audition before, so I didn't know what to expect," Williams said. "They were giving us numbers like I was lining up for a police shot, you know, like a mug shot. When I get up there, everybody belongs to something, except me. I'm talking to these people and everybody either belongs to the Playhouse or they had some kind of background, either theater or some shorts or something like that." With Williams in tow, LDP was ready to go out and start filming. While the cold weather may have left some of the actor's knees shaking a bit too much for some takes, the group meshed so well that Lyons gave them more freedom while shooting. "We wanted to do it more organically, just hide the wireless mics on everybody, put them out in the situation, and let them interact out in the environment," Lyons said. "A bunch of the stuff that these guys thought it wasn't their best takes, but they felt so natural. That's the stuff that we used." "It was a terrific experience," Hooper agreed. "It was ideal, that kind of natural feeling, that freedom to do so without judgment or editing, you know you're just free to roam." That organic look has a big impact on the movie. After raising small funds from a combination of personal finances and online fundraising, "There Are No Goodbyes" was filmed on location as opposed to on sets, giving the film a gritty realism—shooting scenes in an actual restaurant or on a busy street instead of fabricating the same feel elsewhere. With an entire city as their backdrop, the characters could interact with their environment, from an empty park to a bustling bar crowd. While shots of recognizable settings provide a sense of a world made up of more than just our performers, "There Are No Goodbyes" features a fair share of close-ups on its characters, allowing the viewers to gain as much information from expressions as dialogue. This intimate style of filming makes Oliver's quiet reservation speak for itself. King and Williams didn't have too much in common with their roles, but there was one character that didn't have to act at all for its performance in the film: Erie. "Erie is very much a character on purpose," Lyons said. "It's really like taking a snapshot of the area." "There Are No Goodbyes" is a melting pot of ideas. Much like the city of Erie, it contains elements of drama, romance, mysterious happenings, and more. Erie isn't a very glamorous city, nor is it a massive metropolitan area, a locale that would normally attract the attention of film crews. With the history behind the Flagship City, Lyons knew his hometown would be a perfect fit for the film. "We wanted it to be kind of a comment on blue collar America," Lyons said. "Kind of an economical and political comment, really showing progress slamming up against what worked." From the start of "There Are No Goodbyes," Erie oozes from every scene. From the harsh winters to the Skippereno's shirts, the area may be the main star, a perfect backdrop for the film. The movie twists and turns between dramatic and comic moments that locals can witness on their daily ventures on State Street, much like some of the random encounters the cast and crew had while filming. "During filming, we were downtown and it's the middle of February and it's freezing," King said. "We were sitting warming up in the car and we look across the street and there's this guy with his shirt off and shorts on, just boxer shorts, and no shoes running up the road, and we're like 'What the hell is going on?'" "We didn't get it on film, which is such a bummer, but between takes I notice this kind of scrawny, long-haired guy, probably in his early 20s, running down the street with a mattress on his back just right in the middle of street," Flatley added, as the group continued laughing. For outsiders, Erie can seem, well, rather odd. I, myself, must admit I entertained this opinion when I first moved to this town. Spend some time here and you'll begin to understand the city's charms. While some people would interrupt the cast and crew's endeavors (including brazen efforts by members of REO Speedwagon to try and get in the movie), many locals were very willing to lend a hand. "People were so open to helping us out," Flatley said. "The EMTA [Erie Metropolitan Transit Authority] literally let us borrow a bus with its own driver and an assistant. It wasn't as much 'Yeah, you can do this,' but 'How can we help you?'" Several local businesses aided the filmmakers' efforts, giving them the freedom to shoot on location, stuffing the film with recognizable locales. "It was a lot of work, a lot of organization, but all of the locations helped us out so, so much," Lyons said. "You can't do this in New York, L.A., or most cities, really." With so many people helping out on the film, Flatley wanted to give back to the city as well. Along with working on the story, co-producing, and working as prop master, Flatley also served as composer for the film. To complement his original music, he had bands with connections to Erie submit songs to be used in the movie, providing "There Are No Goodbyes" with a soundtrack containing works by local artists, like Bill Burke, The Jargonauts, and Deadhorse, picking from hundreds of submissions to represent the area's talent. With all the local ties, it's not surprising that the cast and crew of "There Are No Goodbyes" consider themselves Erieites, even those like Hooper and Swies that aren't originally from Northwest Pennsylvania. Like the rest of us, they know that Erie, like Oliver, is a flawed character ready to be explored, showing that there's more underneath what can be a cold first impression. "There's a lot of shortsightedness right down the line in Erie history, but there's a lot of cool stuff too, so I think it's a comic illustration," Flatley said. "We're all from here. I've spent enough time here that we can get an idea of its character, its limits, its potentials. Each city has its own thing." 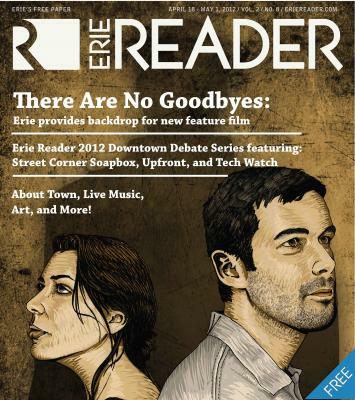 While a lighter side does shine through at times, "There Are No Goodbyes" is, at heart, a film revolving around serious questions, such as the struggle within Erie. "It's the idea of old Erie and new Erie," Flatley said. 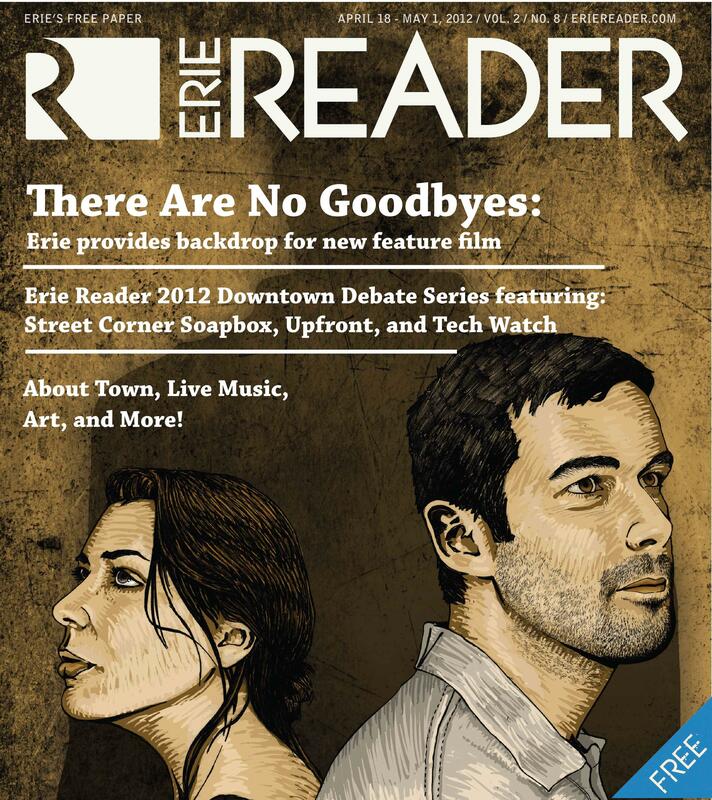 "I've always kind of said that Erie is just like one marginalized community. There's no one main community, there's just slivers. Each group has its own little world and those worlds don't really interact much. You have different groups that should be interacting with each other to make cool stuff happen, but it's just so separated and everyone feels alienated because there's no one dominating group in Erie." The film bounces between these two worlds. Oliver, who's stuck in a town in which several of his classmates are leaving for larger cities and greener pastures, is torn between the older generation, stuck complaining about new ideas for progress and his contemporaries. In a way, Oliver acts as the middle ground between the two worlds, listening to one group complain while the rest depart, leaving him apathetic to the world. Ultimately, Fenris gives him a reason to live, but this newfound purpose raises even more questions about whether one controls their own destiny. "[Fenris] has that demeanor of whatever's going to happen is going to happen and that's the way it's going to be," Williams said. Oliver and Fenris' relationship echoes the idea of free will clashing with destiny. Where one man gives out tasks that must be done because of a set of mysterious guidelines, the other questions these actions. While Oliver grows out of his shell, he looks to make his own path, but Fernis demands that he serve his purpose. In fact, Fenris' name is even a sly nod to Scandinavian mythological take on the subject. "If you look at fate from a Viking perspective or a Norse perspective it is not so much about that you're born and everything is predetermined, but more that you're put into a situation and it's your job to make the best of that situation," Flatley explained. "If you're put into a situation where you have to fight, you fight the best that you can. You don't bemoan the fact of your situation, because even the choices you make and the decisions you make can have an outcome for yourself. It's all part of the same ocean, if you will. If you kick too much and make too many waves, that can affect other people down the line." Throughout the film, we see the ripples of Oliver's actions affect others. We don't always know how or why, but the impact is noticeable, giving each person a purpose. "There Are No Goodbyes" shows that even the smallest of tasks can make waves, and each person matters. Tied in with the generational inactivity and the underlying purpose without action, results can't happen. With some searching, however, one can notice some exciting possibilities. "So many people think that nothing really happens in places like this," Flatley said. "But in the 21st century you bump into so many people that are centered here. There's a lot of weird stuff that goes on here in a cool way." Perhaps that is the theme that parallels Erie best. While the lack of progress between new Erie and old Erie may stymie change, everyone in this city has a part to play in the overall scope of things, including the mattress-bearing, shirtless crowd and the past-their-prime rockers. As for the people behind "There Are No Goodbyes?" Maybe their purpose was to make a film to point out these very ideas. Perhaps they wanted to entertain you. At the very least, Erieites can know that they have a movie that accurately portrays their city. "The movie is so Erie," Lyons said. "It's relatable to anybody, but people that live here are going to feel the connection." Even after just five years in this town, I noticed it right away. From the need to prepare for a blizzard in order to merely go outside to get your paper in the winter to watching septuagenarians walk around the Millcreek Mall, the Gem City is the ultimate star. It doesn't hurt that "There Are No Goodbyes" feels like a story filled with flawed, unique, and, ultimately, very real characters thanks to the cast and crew behind the film. It's a story with several storylines intertwining together, melding different themes all at once. While some may find the number of developing plot lines distracting, it's rather appropriate for Oliver's progression. Life doesn't wait for you to tie up one story before it unravels another. While Oliver and Raina may not be exact duplicates of anyone, you can relate to their trials in this city. Four years ago, this film was just an idea. Now, "There Are No Goodbyes" will be shopped around to different film festivals around the country, embodying the area's creativity and ability. "We hope we can really represent the talent that's here in this area," Lyons said. There will be more films in the future of Lyons Den Productions, but Erie has clearly had an impact on them, just like the rest of us Erieites. Just like Oliver, we know what it's like to be surrounded by flurries of snow, trudging along the frozen path as we make our way home. Some of us may move away eventually, but once you really get to know Erie, there are no goodbyes to the Erieite inside us.